Donald Trump seems to live in a world in which there is global trade but no foreign direct investment. He recently denounced BMW imports at a South Carolina rally while ignoring the German automaker’s production facility a short distance away in Spartanburg, which has been in operation since 1994. In fact, Harley already has offshore production facilities. One of those is in India, which was originally announced in connection with President Obama’s November 2010 trip to that country to promote U.S. commercial interests. Republicans denounced the trip, not because of job offshoring but rather because of exaggerated reports of the cost of the delegation. Harley initially used the Indian operation to assemble bikes shipped in knocked-down form from U.S. plants, but later it began using locally produced components. In 2012 Harley outsourced much of its IT work to the Indian company Infosys, some of whose employees on the account worked in the U.S. There were reports in 2014 that Harley IT workers were being asked to train Infosys employees on H-1B visas who were replacing them. The company also has an assembly facility in Brazil and a manufacturing plant in Australia that produces high-finish wheels. In its 10-K filing Harley states: “The motorcycles assembled at the Company’s international facilities have the same authentic look, sound, feel and quality of a motorcycle manufactured by the Company’s U.S. facilities.” Moreover, Harley announced earlier this year that it is shifting some production from a plant in Kansas City to one in Thailand. The Harley situation is just the latest in a series of tiffs between Trump and large corporations in which it is difficult to support either side. Harley certainly needed to be called out for engaging in more and more offshore outsourcing while continuing to promote an all-American image. Trump’s criticism of the company, however, is far from coherent. It seems to be based mostly on his feeling that he was personally betrayed by a firm that he touted as a symbol of American greatness. Trump seems to have picked a fight with Harley in the same way he has gone after other companies, starting with Carrier soon after his election. He has done so mainly to burnish has own tough-guy image while in the end failing to extract any real concessions. The same goes for is supposed battles with pharmaceutical producers, aerospace manufacturers, automakers and others. Trump’s objective is to give the impression he is taking a hard line against big business, while he is actually catering to every desire of corporate America when it comes to regulation and taxes. It is the flip side of his posture toward workers, in which he pretends to be their defender but is in reality undermining employment safeguards and labor rights. How long can the skullduggery continue? A few decades ago, U.S. factory jobs began moving offshore to countries that lured corporations with the prospect of weak or non-existent unions, minimal regulation, lavish tax breaks and other profit-fattening benefits. Workers in those runaway shops enjoyed little in the way of a social safety net, thus making them all the more dependent on whatever dismal employment opportunities foreign firms had to offer. Much of the U.S. manufacturing sector was left for dead. Now, we are told, U.S. manufacturing is undergoing a resurrection. “Manufacturing is coming back,” President Obama told a group of blue-collar workers at a recent public event. “Companies are bringing jobs back.” Obama earlier used the State of the Union address to tout the recovery of the U.S. auto industry in the wake of the bailout he championed. One of the bailed-out firms, Chrysler, aired a Super Bowl commercial called “It’s Halftime in America” in which Clint Eastwood hailed the country’s industrial recovery. It’s true that manufacturing employment has been on the rise after many years on the decline. But is this something calling for unqualified celebration? Boosters of the industrial resurgence would have us believe it is a reflection of improved U.S. productivity, entrepreneurial zeal or, as Obama put it in the State of the Union, “American ingenuity.” In the case of Chrysler, that should be Italian ingenuity, given that the bailout put the company under the control of Fiat. But it can just as easily be argued that domestic manufacturing is advancing because the United States has taken on more of the characteristics of the countries that hosted those runaway shops. Deunionization, deregulation, corporate tax preferences, excessive business subsidies and a shriveled safety net are more pronounced than ever before in the U.S. economy. If any of the Republican Presidential candidates get in office, those trends will only accelerate. Even the Obama Administration is on the bandwagon to a certain extent. Its Office of Information and Regulatory Affairs has obstructed a slew of new environmental and workplace safety regulations. Now the President has legitimized years of conservative rhetoric claiming that companies are overtaxed by introducing a corporate tax reform plan that would reduce statutory rates in general and create an even lower rate for manufacturers. The plan has some good intentions—such as ending special giveaways to Big Oil and other loopholes while encouraging corporations to bring jobs back home—but it ignores years of evidence from groups such as Citizens for Tax Justice showing that big business will exploit any softening of the tax code to bring its actual payments down to the absolute lowest levels. The perils of joining the manufacturing revival chorus can be seen by looking at heavy equipment producer Caterpillar. The company has been getting a lot of attention lately for expanding its domestic employment through moves such as the planned construction of a $200 million plant in Athens, Georgia that is projected to employ about 1,400. This needs to be put in some context. According to data in Cat’s 10-K filings, the company’s workforce outside the United States soared from around 13,000 in the early 1990s to more than 71,000 last year, growing to some 57 percent of the firm’s total employment. The number of foreign workers in 2011 was greater than the company’s total head count in 2003. Cat’s love affair with places such as China blossomed as the company was trying to escape its U.S. unions, which it had unsuccessfully tried to destroy. Cat’s hard-line approach to collective bargaining soured relations with its workers, resulting in a series of strikes and other confrontations, including a dispute in the 1990s that lasted for more than six years. It appears that unions have no role in Cat’s limited back-to-the-USA plan. The company’s new domestic facilities tend to be located in “right to work” states. After recently trying to impose huge pay cuts at a factory in Ontario (photo), Cat first locked out the workers, then shut down the plant and is now reported to be shifting the work to a facility in Muncie, Indiana, the latest state to adopt a “right-to-work” law to hamstring unions. By locating the Athens plant in a labor-unfriendly state such as Georgia, Cat is expected to be able to pay wages far below those in its unionized plants. It is also worth noting that Cat agreed to build the plant in Georgia only after it received $75 million in tax breaks and other financial assistance, one of the largest subsidy packages the state has ever offered. The message of all this seems to be that the U.S. can enjoy a renewal of manufacturing if we are only willing to put up with a few minor inconveniences such as union-busting and big tax giveaways to corporations. That’s apparently what is really meant by American ingenuity. One of the usual canards of the corporate tax reduction crowd is that high U.S. rates force large companies to invest offshore instead of at home. The Institute on Taxation and Economic Policy and Citizens for Tax Justice have just issued the second installment of their detailed refutation of the myth of oppressive rates. After putting out a report last month showing that many large corporations end up paying far less than the statutory federal rate (so much less that their rates often become negative), ITEP and CTJ now demonstrate that the story is the same at the state level. Their study, Corporate Tax Dodging in the Fifty States, lists 68 Fortune 500 companies that managed to pay no state income tax at all in at least one year during the period from 2008 through 2010 despite posting a total of nearly $117 billion in pre-tax U.S. profits during those no-tax years. Sixteen of the companies—including the likes of DuPont, Tenet Healthcare, International Paper, Intel and Peabody Energy—had more than one no-tax year. DuPont, Pepco Holdings and American Electric Power contributed nothing to state coffers in all three years. The report points out that, if the 265 companies in the sample had all paid the average 6.2 percent average corporate tax rate on their combined $1.33 trillion in U.S. profits, their state tax bill would have been about $82 billion. Instead, they paid only $40 billion, meaning that states were left without $42 billion in revenue that could have been used to help pay for education, healthcare, transportation, public safety and other key state government functions. A system that allows many companies to sidestep millions of dollars in state tax payments can hardly be called onerous and certainly can’t be the reason for investing overseas. It is thus no surprise that the ITEP/CTJ list of firms with negative or minimal tax rates includes corporations that engage in extensive offshoring; among them are Eli Lilly, General Electric, Hewlett Packard and Merck. At the same time, the key state tax dodgers include some manufacturing companies that have (at least in part) bucked the offshoring trend and made substantial investments in the United States. Chief among them are Intel and Boeing. Intel, which has been spending billions on semiconductor fabrication plants in state such as Arizona, and Boeing, which focuses its aircraft assembly in Washington State and South Carolina, are major recipients of the kind of company-specific tax breaks that the ITEP/CTJ report cites as one of the reasons for the decline of state corporate income tax collections. Intel has been playing the subsidy game in earnest since 1993, when it announced plans for what was then an unprecedented $1 billion investment in a new chip plant, to be built in a suburb of Albuquerque called Rio Rancho. The company pressured local officials to provide what would ultimately amount to about $455 million in property tax abatements and sales tax exemptions on the equipment purchased for the facility. Soon after getting its way in New Mexico, Intel put the squeeze on officials in Arizona, where it proposed to build another plant in Chandler, a suburb of Phoenix. The company received some $82 million in property tax abatements, sales tax exemptions and corporate income tax credits. In 2005 Intel strong-armed the state to change the method by which it calculates corporate taxes to a system known as single sales factor, which allowed Intel and other companies with lots of property and a big payroll but relatively low sales in the state to enjoy enormous tax reductions. In 1999 Intel announced plans for a large expansion of its semiconductor operations in Oregon but made it clear that the investment was contingent on receiving a property tax abatement that turned out to be worth an estimated $200 million over 15 years. In 2005 Intel got the county to extend the property tax break to 2025, locking in an estimated $579 million in additional savings. Intel also enjoys a substantial reduction in corporate income taxes thanks to Oregon’s decision to join the single sales factor bandwagon. Boeing has also sought special tax breaks and other subsidies in multiple states. When the company was ready to begin production of its much-anticipated Dreamliner, it forced Washington to compete with around 20 other states for the work and agreed to stay there only after the legislature in 2003 approved a package of research & development tax credits and cuts in Business & Occupation taxes (the state’s substitute for a corporate income tax), sales taxes and property taxes that together were estimated to be worth $3.2 billion over 20 years. Rather than showing its appreciation to Washington, the company went shopping for a better deal for the second Dreamliner production line. It chose South Carolina, where it was awarded a subsidy package that has been valued at more than $900 million and is able to take advantage of a “right to work” law that discourages unionization. The Machinists union accused the company of retaliating against union activism in Washington, but the complaint has just been withdrawn as part of a deal in which Boeing will build its new 737 in the Seattle area. While it was once taken for granted that large U.S. corporations would do most of their investing at home, companies such as Boeing and Intel now act as if they are doing the country a favor with their domestic projects and expect to be rewarded handsomely in the form of special state tax breaks on top of those business-friendly provisions available to all firms. Far from being held back by tax rates, large U.S. corporations invest offshore or onshore as they please while contributing as little as possible to the cost of public services. President Obama’s grand plan for job creation has not yet been released but it is already struggling. The capitulation to Speaker John Boehner on the scheduling of Obama’s speech to Congress about the plan is a sign of things to come. Yet perhaps even more troubling is the announcement by a company that served as a showcase for the administration’s campaign to promote jobs in renewable energy that it is shutting down, sticking taxpayers with the bill for $535 million in federal loan guarantees. Solar panel maker Solyndra’s decision to close its manufacturing plant in California and file for bankruptcy will put more than 1,100 people out of work. Conservatives are having a field day arguing that Solyndra’s demise illustrates the folly of government involvement in the market. It is hilarious to hear many of the same lawmakers who refuse to end subsidies to the ethanol industry and tax breaks for Big Oil get indignant about assistance to wind and solar companies. It is also amusing to see Republicans try to turn the Solyndra debacle into a story about Obama Administration stimulus cronyism. Solyndra was approved for loan guarantees in 2007 by the Bush Energy Department based on the Energy Policy Act passed by Congress in 2005, though funding for the program was not appropriated until the 2009 Recovery Act. The real issue is why Solyndra, even with the loan guarantees, was not able to succeed in a market that is supposed to be the wave of the future. And it’s not just an issue of this one company. Evergreen Solar, which received more than $40 million in state government subsidies in Massachusetts, filed for bankruptcy recently. Other U.S. renewable energy firms are also facing difficulties. Rather than simply debating this country’s half-hearted industrial policy, more attention should be paid to the failures of the companies themselves. U.S. solar panel producers, for instance, were slow to get started and allowed foreign competitors to gain a strong foothold in the international market. It is customary for firms such as Solyndra and Evergreen to cite low-cost producers in China as a key reason for their plight. What the U.S. renewable energy manufacturers fail to mention is that some of them helped develop the Chinese solar industry by locating some of their own facilities in that country. At the same time, companies like First Solar and SunPower Corporation have intensified global cost competition by building plants in other cheap-labor havens such as Malaysia and the Philippines. Some European companies have shown it is possible to compete without depending on low wages offshore. Germany’s SolarWorld, which is in the top tier of global producers, does most of its manufacturing in its home country and in the United States (including a plant in Oregon that has received state subsidies). In June it sold off its share in a joint venture in South Korea, saying that it had “decided in favor of production at locations with the highest quality, environmental and social standards.” Imagine a major U.S. corporation saying that. The fact that many U.S. companies—green or otherwise—cannot or will not compete by adopting a high-road approach does not bode well for the country’s future. As long as wages remain low or stagnant, the buying power of American workers will remain weak, and this in turn will keep the economy in a funk. Compounding the problem is that, apart from a few tech sectors, innovation in American business seems to be limited to finding new ways to lower tax bills and increase executive compensation. A new report by the Institute for Policy Studies does a good job of linking the two, showing that numerous large corporations are now remunerating their CEOs more each year than the firms are paying in federal income taxes. Many of these same companies are not hiring in the U.S., preferring to rely instead on those offshore labor havens and extracting more work out of their existing domestic employees. This is the dilemma facing the job proposals of the Obama Administration and state governments: they all ultimately rely on action by corporations whose outlook these days is dominated by executive self-enrichment, tax dodging and labor exploitation—not the creation of quality jobs. Happy Labor Day. The rightwing media machine is up in arms about a dubious report that the cost of President Obama’s trip to India will turn out to be more than $200 million a day, for a 2,000-person entourage. The White House calls the cost figure wildly inflated. The manufactured controversy about cost is taking attention away from what should be the main story: who is accompanying the President on the trip and what do they hope to get out of it. A big part of Obama’s entourage will be scores of top U.S. corporate executives, who are seeking Obama’s help in initiating or finalizing big deals with the Indian government and Indian corporations. Numerous other U.S. companies are not sending executives on Obama’s trip but are still hoping the visit will advance their interests in India. Among the deals that have been reported are: the sale of ten military transport planes worth some $5 billion by Boeing and the sale of $800 million in fighter jet engines to the Indian military and $500 million in heavy duty gas turbines to India’s Reliance Energy, both by General Electric. Other dealmakers are said to include Eaton Corp., John Deere, Caterpillar and Harley-Davidson. In other words, a President endlessly denounced by the Right as a socialist, is serving as a shill for some of the country’s largest corporations. This is far from the first time an American president has acted as salesman-in-chief for American products, and the White House makes no apologies for the trip, claiming that it will result in the creation of thousands of jobs. The problem is that it is far from clear that landing big deals for U.S.-based corporations will result in many jobs for U.S. workers. The list of companies with executives going to India with President Obama (or that stand to benefit from the trip) include some of the most notorious practitioners of offshore outsourcing. Take the two heaviest hitters on the trip. Boeing has made a science of shifting work from its traditional manufacturing operations around Seattle to factories around the world. It has clashed repeatedly with its unionized workers over the issue. And when it’s not sending jobs abroad, it moves them to domestic non-union plants, such as its big new operation in South Carolina. General Electric is another unabashed offshorer. In the early 1990s about one-quarter of the company’s employees were outside the United States; at the end of last year, 56 percent of them were. What’s especially frustrating is that GE is offshoring jobs in emerging fields such as renewable energy, thus depriving many American workers of a shot at the jobs of the future. Eaton, a diversified manufacturer of industrial products, now has 27 facilities in China with some 10,000 workers as well as four research and development centers in the country. In April, John Deere opened a manufacturing plant and parts distribution center in Russia. It already had factories in low-wage countries such as Brazil, China, Ecuador, India and Mexico. Caterpillar has eight plants in China, eight in Mexico, three in India and many more in other countries. It recently opened a logistics center in China to support what a company press release called its “growing manufacturing footprint” in that country. Harley-Davidson is an icon of U.S. manufacturing, but it just announced plans to open a new plant in India to assemble U.S.-made motorcycle kits. 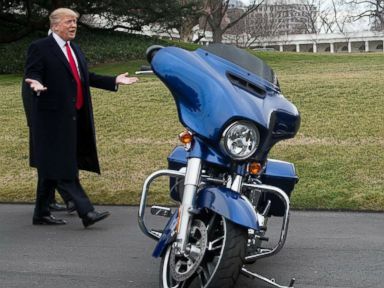 It is unclear whether this will increase or decrease jobs at the company’s American plants, which have been exporting fully assembled motorcycles to the Indian market. It’s true that these companies have to do a certain amount of production in countries such as China and India to sell to local customers, yet it is also undeniable that these firms and others seeking benefits from Obama’s trip have been reducing manufacturing operations in the United States that previously supplied goods for both domestic and foreign markets. There is no guarantee that the jobs Obama hopes to generate with his sales trip to India will end up going to Americans. The companies whose wares he is promoting are in many cases American only in terms of where their headquarters are located. They are all too willing to destroy the livelihood of U.S. workers in their global pursuit of cheaper labor and fatter profits. That kind of behavior costs this country much more than what the President’s delegation could ever spend on its trip to India.